E. G. Washburne & Co.
A 136-page catalog, Made in New York City: The Business of Folk Art (American Folk Art Museum, 2019), is available to purchase at the Museum Shop. 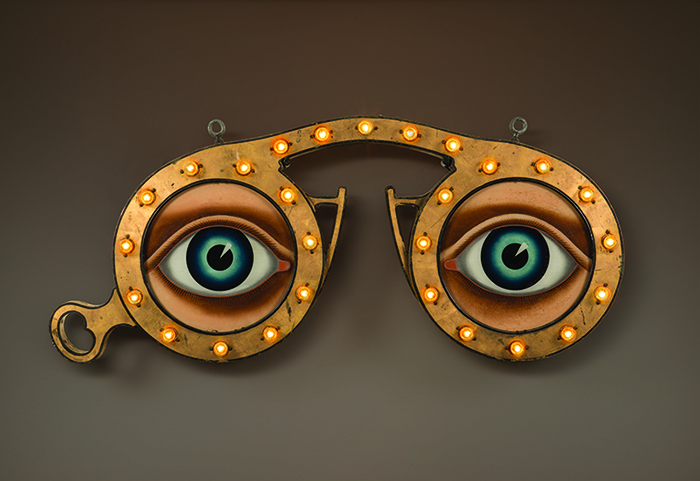 Images: Optician’s Trade Sign; E. G. Washburne & Co., 207 Fulton Street, New York City; c. 1915; paint and gold leaf on zinc and iron, with glass and light bulbs; 26 x 54 x 4 in. ; collection of Penny and Allan Katz. Photo by Gavin Ashworth. 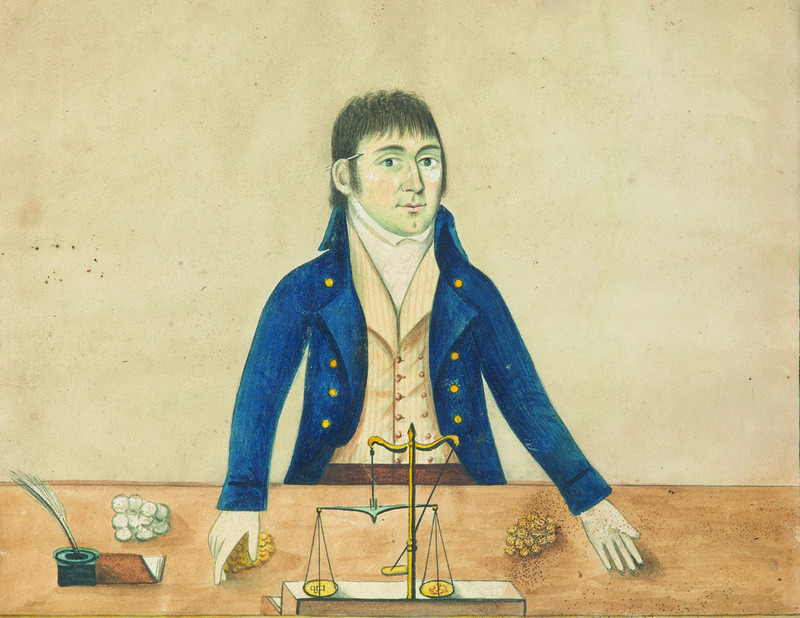 Herman Raub Engaged in Weighing Gold at the Manhattan Bank at New York (detail), artist unidentified (possibly Mr. Thompson”), New York City, 1805, watercolor and pen and ink on paper, 12 1/4 x 9 3/4 in., private collection. Photo by Gavin Ashworth. 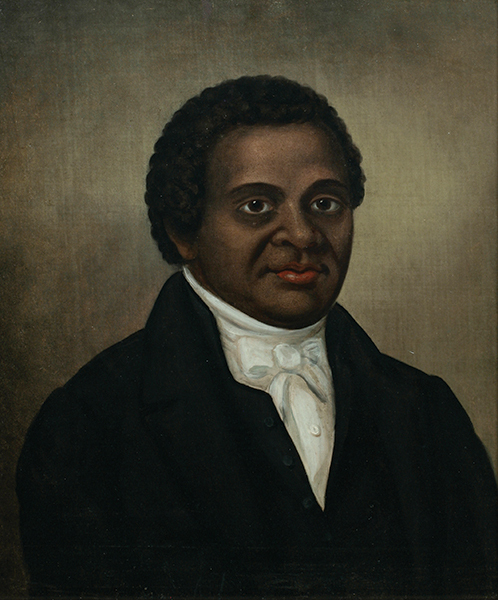 Portrait of Peter Williams; artist unidentified; New York City; c. 1810–1815; oil on canvas, 25 x 20 1/2 in. ; collection New-York Historical Society, X.173. Photo © New-York Historical Society. 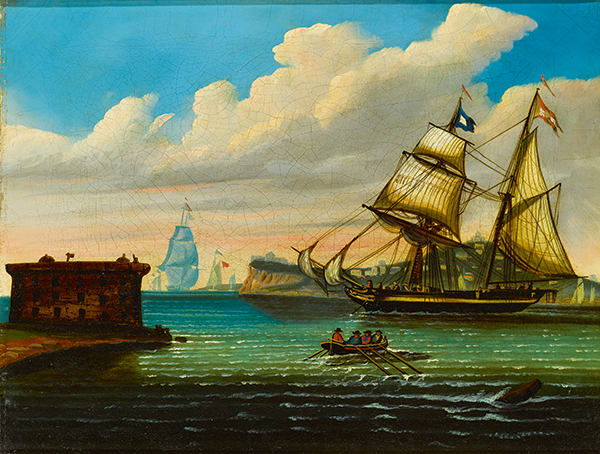 New York Harbor with Castle Williams and Ships, attributed to Thomas Chambers (1808–1869), New York City, c. 1838–1845, oil on canvas, 22 x 30 in., private collection. Photo courtesy of Sotheby’s. 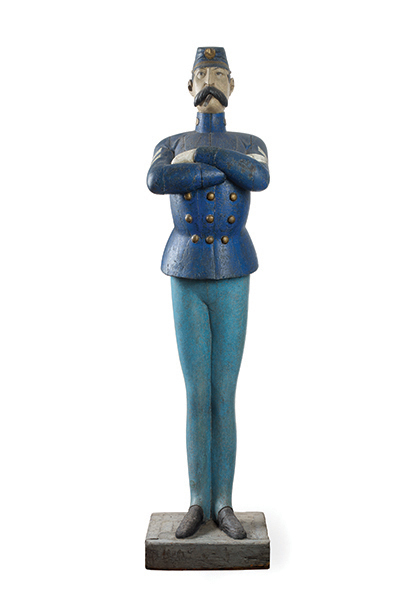 Captain Jinks Show Figure, possibly Thomas J. White (1825–1902), New York City, c. 1880, paint on wood, 75 x 17 x 17 in. with base, collection of John and Barbara Wilkerson. Photo by Ellen McDermott Photography. 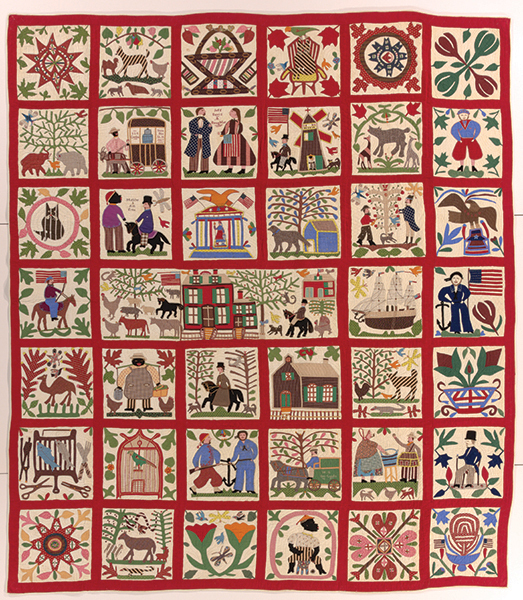 Reconciliation Quilt; Lucinda Ward Honstain (1820–1904); Brooklyn, New York; 1867; cotton; 97 x 84 ½ in. ; collection of International Quilt Study Center & Museum, University of Nebraska-Lincoln, gift of Robert and Ardis James, 2001.0011.0001. 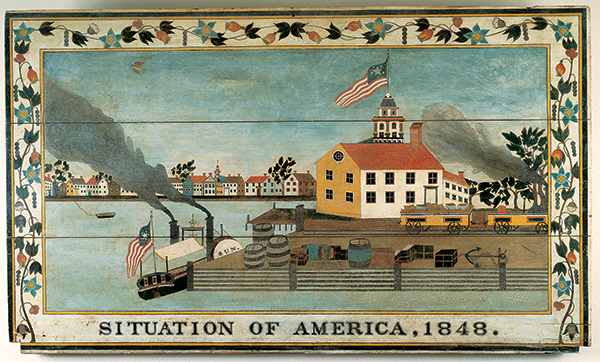 Situation of America, 1848.; artist unidentified; New York City; 1848; oil on wood panel; 34 x 57 x 1 3/8 in. ; collection of American Folk Art Museum, New York, gift of Ralph Esmerian, 2013.1.21. 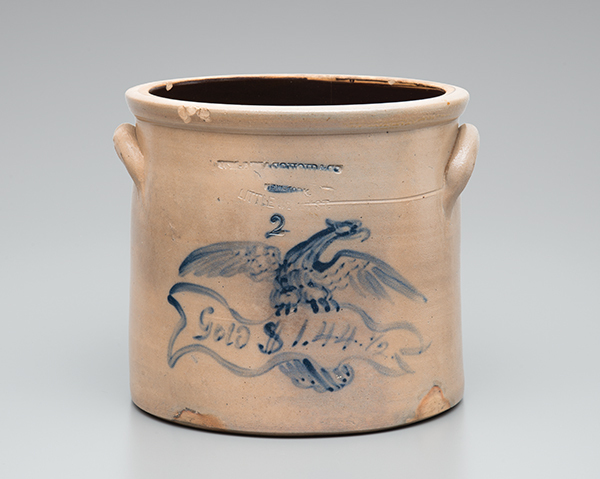 Two-Gallon Crock with Eagle; W. A. MacQuoid and Company Pottery Works, Little West 12th Street, New York City; c. 1869; stoneware with cobalt decoration; 11 ½ x 10 ½ in. diameter; private collection. Photo by Gavin Ashworth. 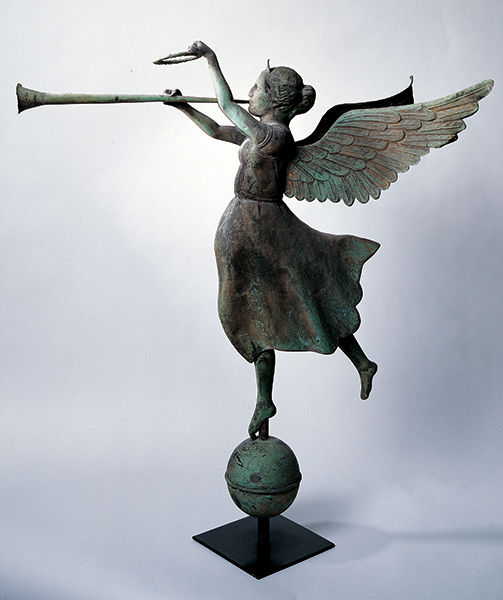 Fame Weathervane; attributed to E. G. Washburne & Co.; New York City; c. 1890; copper and zinc with gold leaf; 39 x 35 ¾ x 23 ½ in. ; collection of American Folk Art Museum, New York, gift of Ralph Esmerian, 2005.8.62. Photo by Gavin Ashworth. Major support for this exhibition is provided by the Lily Auchincloss Foundation, Inc., with additional support from Bloomberg Philanthropies, the David Davies and Jack Weeden Fund for Exhibitions, the Gladys Krieble Delmas Foundation, the Ford Foundation, Richard C. von Hess Foundation, and the American Folk Art Society. Public funds were provided by the New York City Department of Cultural Affairs in partnership with the City Council, and the New York State Council on the Arts with the support of Governor Andrew M. Cuomo and the New York State Legislature. Special funds for the catalog were provided by Furthermore: a program of the J. M. Kaplan Fund, and the Dorothea and Leo Rabkin Foundation.